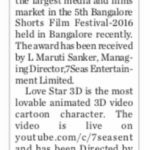 7Seas Entertainment Limited,a Hyderabad-based Intellectual Property(IP) based independent game development company (BSE– 7Seas scrip code 590116) has bagged the ‘Best Music Video Award’ for its Animation Video-“LoveStar 3D” under the Animation Category. March 12th, 2013: 7Seas Entertainment Limited, a Hyderabad-based independent game development company, has bagged the prestigious FICCI-BAF (Best of Animation Frames) award for its ‘The Dark Man-2’ game under the ‘Best Browser Game’ category. Hyderabad October 10,2012: 7Seas Entertainment Limited (formerly 7Seas Technologies Limited,BSE scrip code-590116),today announced that it has won the ‘International Gold Stevie® Business Award-2012′ for its free online gaming portal www.onlinerealgames.com under the ‘Best Website Design’ category. Hyderabad, March 16, 2012: 7Seas Entertainment Limited a Hyderabad-based, intellectual property (IP)-based independent game development company,has bagged prestigious FICCI-BAF (Best of Animation Frames)-2012 awards- for its ‘Killer Instinct’ online game under the ‘Best Online Game’ category. December 12th, 2011: The most played physics game The Dark Man of 7Seas Entertainment Limited bas bagged CSI (Computer Society of India)-2011 Appreciation Award. December 13th, 2011: The Dark Man, the most popular physics based shooting game from 7Seas Entertainment s stable, has recently bagged the 24FPS 2011 MAAC International Animation Award under the Best Game Design category. December 1st, 2011: www.mobizill.com a mobile content publishing website of 7Seas Entertainment Limited has bagged the prestigious “Stevie International Business Award” under “Best Mobile Site” category. October 09th, 2011: Game Developer 7seas Entertainment Ltd has bagged 2011 webAward “Game Site Standard of Excellence” under Best of Industry Category for outstanding achievement in website Development for its online gaming portal. March 24th, 2011: 7Seas Entertainment Limited, a Hyderabad-based independent game development company, has bagged the prestigious FICCI-BAF (Best of Animation Frames) award for its ‘The Dark Man’ game under the ‘Best Online Game’ category. December 14th, 2010: 7Seas Entertainment Limited has bagged the “Intel AppUp Developer Program” Award as “Winner of India Innovate 2010 Contest” for its wonderful games WordMaster, MathFun, Castlecoins, Mapmaking, Puzzle Out, Kidz Sudoku, Phrase Master and Flora Fun. April 9th, 2010: 7Seas Entertainment Limited,a Hyderabad-based independent IP-based games development company has bagged FAPCCI (Silver Rolling Trophy) Award for the year 2008-2009 under OUTSTANDING IT COMPANY. Game Developer 7Seas Entertainment has bagged 2009 WebAward “Game Site Standard of Excellence” under Best of Industry Category for outstanding achievement in Website Development for its online gaming portal which was presented by Web Marketing Association, USA. Game Developer 7Seas Entertainment has bagged 2008 WebAward – ‘Best Game Site WEBSITE’ under Best of Industry Category for outstanding achievement in Website Development for its online gaming portal www.onlinerealgames.com which was presented by Web Marketing Association, USA. We are glad to share our happiness that our www.onlinerealgames.com a unique free online gaming portal of 7Seas Entertainment Limited has bagged ” W3 Award ” under ” Games ” category by ” The W3 Awards “, West Hollywood, California. 7Seas online gaming portal www.onlinerealgames.com has won the most prestigious ” The Davey Award ” for 2008 by ” The International Davey Awards “, New York under ” Games ” category with over 4000 entries from across the US and around the world, the Davey Awards honors the finest creative work from the best small firms, agencies and companies worldwide. www.onlinerealgames.com, a unique free online gaming portal of 7seas Entertainment Limted, has won the prestigious 2008 International Stevie Business Award in the “Software Programming/Design” category. The award was presented to Mr.L Maruthi Shanker, Managing Director of 7Seas Entertainment, on September 8, at the fifth Annual International Business Awards function held in Dublin, Ireland. We are on cloud nine to share our feelings with you that www.onlinerealgames.com has won the 2007-Web Award GAME SITE STANDARD OF EXCELLENCE from Web-Marketing Association for outstanding achievement in website development.